. Published on October 16, 2018 . Over the summer there was quite the flutter of activity in both the 624 South Michigan Ave. and the 33 East Congress Parkway buildings. Books were orphaned in hallways waiting for new owners; desks and cabinets were disassembled; and everyone wore sweatshirts and yoga pants to work. This was all because the Department of English and Creative Writing (ECW) consolidated into one space in 33 E. Congress. Now that we’re all together, how does it feel? For the first two years of my Columbia College Chicago experience, my classes were split between Michigan Avenue and Congress Parkway. Trekking between the two is nothing to complain about – it’s something like a three-minute walk (waiting for the elevators, however, can seemingly add hours onto the commute) – but there was a sense of not being anchored. To be honest, I prefer the Michigan Avenue location. I’d schedule conferences with my instructors just to enjoy the view some of their offices had of Grant Park and Lake Michigan. My beloved library and the bookstore are at 624 Michigan Avenue as well. Finally, there was a sense of prestige being at the Michigan Avenue address. The terracotta ornamentation of the façade is much more to my taste than the more utilitarian aesthetic of Congress Parkway. But, you know, a pretty face is nothing without a heart. The Michigan Avenue building has terrible aging infrastructure. 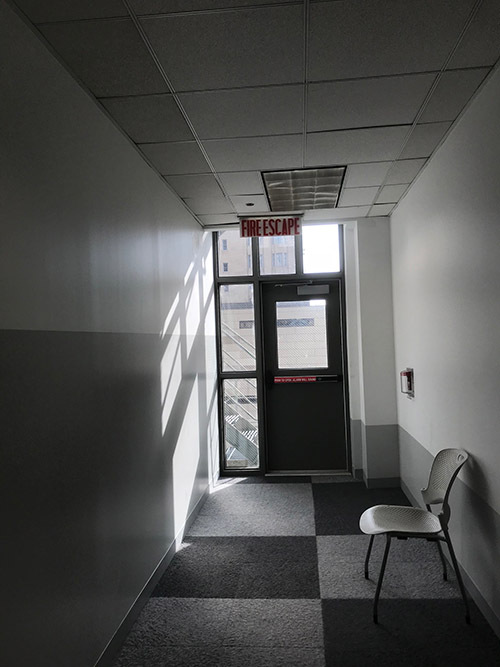 Besides the elevators, which seem to lift and fall as if propelled by human breath, the classrooms have antiquated heating and cooling systems. There’s also the matter of the bathrooms. You know that one Instagram filter that makes everything look all amber and as if you’re looking through the eyes of a ghost? No filter needed there. More importantly as I recall, there are no gender-neutral bathrooms at 624 South Michigan. For all its faults, Congress Parkway has much, much more to offer. The third floor in particular has been modernized and many ECW staff have their offices there. There are still beautiful views of our metropolis like the bustle on State Street and the grandeur of the Harold Washington Library. We also have a spacious lounge with couches for those idle hours between classes, though I’m hard pressed to think of any student with idle hours. The sign is modest, but the man is hugely important. Most importantly, all our faculty and staff are now together–split between the third and fourth floors. I do believe being consolidated affords for greater communication and an increased flow of ideas. I’m seeing more of my colleagues, and seeing them more often. I can meet with my thesis advisor, Dr. Jenny Boully (also Director of the Creative Writing MFA program), then walk down the hall to ask something of Dr. Kenneth Daley (Chair of the Department). Plus, the Congress Parkway building is dangerously close to Cafecito, my favorite restaurant in all of the Loop. I’d like to point out that the staff really stepped up during and after the move. 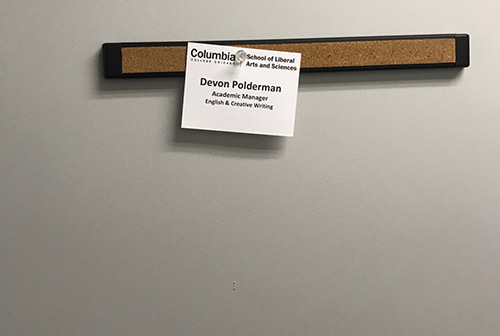 Devon Poldermon (Academic Manager and Adjunct Faculty) and Jennifer Loeb (Manager of Operations) worked their butts off all summer to ensure faculty, staff, and students would be comfortable and ready to go once the Fall 2018 semester started. All in all, I’m pleased with the move. You don’t have to be on the Magnificent Mile to have wonderful things.